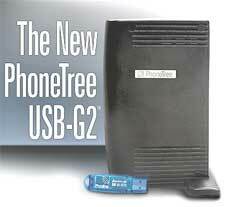 PhoneTree VoiceWave® connects to your computer's USB (Universal Serial Bus) and operates with Windows 98, Me, 2000, XP, Vista and Windows 7. No training is required. Just plug-in the supplied phone and USB cables, load the software from your PhoneTree VoiceWave ® CD and you're ready to go. Background Operation: VoiceWave runs in the background so you can use your computer for other functions while it is dialing. Message Length: VoiceWave allows you to record messages that are as long as four minutes. Expandability: Start off with a single line system and when you need it expand it up to as many as 4 lines. You can increase your capacity to as many as 48 lines with the PhoneTreeVoiceWave Plus system. On-Screen Help: VoiceWave has built-in, easy-to-use on screen help. Accepts Touch-tone Response: PhoneTree VoiceWave allows the called party to leave a touch-tone responses, as many as 6 per call to respond to your questions. You can view who left responses along with the number that was called in your log file. Remote Dial-in Capability This means that you can have up to 36 different managers or group leaders with the ability to remotely call into the VoiceWave and initiate call-out sessions for their individual groups. There's no need to be at the system; they'll be able to initiate their sessions from any home, work or cell phone! For Text-to-Speech integration with your PhoneTree system, check out the PhoneTree VoiceWave Premium . You can download the PhoneTree VoiceWave manual by clicking on the link directly below"